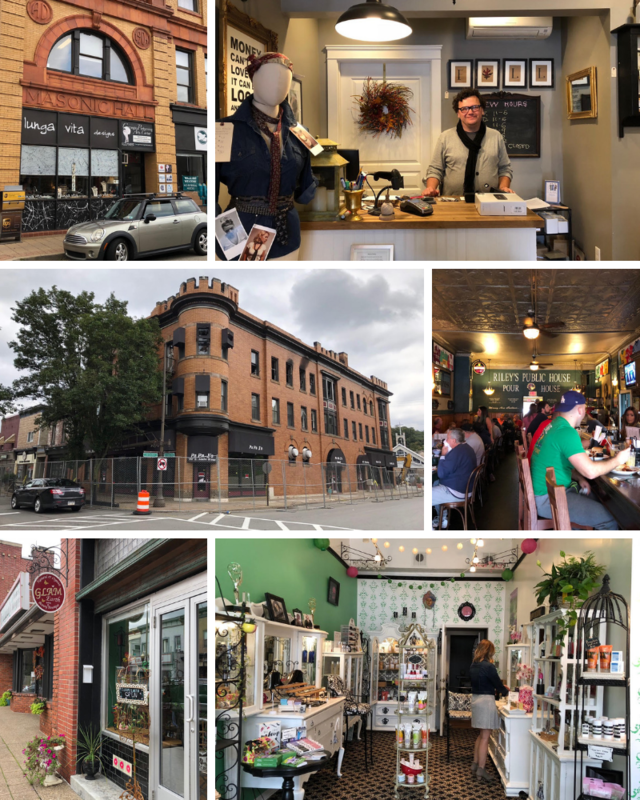 With a charming and increasingly lively Main St. and a historic library endowed by Andrew Carnegie himself, the old borough of Carnegie is now attracting young residents. Take the very walkable Main Street with its impressive mix of retail stores and eateries that continues to attract an interesting mix of independent businesses. Just ask Chuck Beard of Abandoned Pittsburgh, who loves the location of his new photography gallery so much that he convinced Blake Anthony of Pittsburgh Pottery to move in down the street. Larry Scott and George Arnold are the pair behind the very appealing Modern Mercantile, which carries lots of cool goods, including many by local makers. The store’s picture-perfect displays are ever-changing and reason enough to visit. More interesting stores await: Lungo Vita, a tiny shop housed in the old Masonic Hall, is brimming with an irresistible selection of earrings and jewelry. Firebox Art Studios features only women artists, and Glam Earth is a super pretty spot for getting pampered. Further aloft, 3rd St. Gallery is a long-time art and framing gallery that features music and other events. One of the best things about Main St. are the places to eat and drink. Start with Carnegie Coffee Company for Italian espresso and pastries served within a striking former post office. There’s lot of natural light and two floors with ample seating. Bakn is a fun and popular spot for breakfast, lunch and dinner. Don’t miss One Thirty One East, a “world fusion freestyle restaurant,” which is highly regarded. For fresh Italian dishes, head to LeoGreta, which is helmed by chef Greg Alauzen, who grew up in Pittsburgh, moved to New York and was head chef at Eleven and Steelhead Brasserie. Like many others on the street, he takes great pride in being in Carnegie. There’s more, such as Barb’s Country Junction Cafe, Sunset Pizza & Grille, Slice on Broadway and Cafe Delhi. Across the street is a good ‘ol Irish pub, Riley’s Pour House, which owner Jim Riley established in late 2011 in a building that’s housed various watering holes since 1936. Their Saturday brunch with $2 mimosas and bloody marys packs ’em in. Or if you’re into meads (aka honey wines), check out what’s on tap at the uniquely inviting space of Apis Mead & Winery. Beyond Main St, this borough features an Aldi, Family Dollar, and Rahma Grocery, which specializes in African, Asian and Middle Eastern products. For recreation, Carnegie Park on Forsythe Road boasts walking trails, a dog park, tennis courts, a hockey rink, miniature golf and more. Skateboarders, rollerbladers and BMX bike riders especially adore Pitcher Park Memorial Skatepark. Another public hotspot for children and adults of all ages is the Andrew Carnegie Free Library & Music Hall, which opened in 1901 and is recognized as a historic landmark. The borough also has its own Boys & Girls Club, which hosts all kinds of great programs for kids 6 through 18. Not to miss along Main Street is the chance to step into the nostalgic ice cream parlor at The Flying Squirrel for a refreshing scoop. Jump Cut Theater recently moved in to share the space, hosting independent film screenings and eclectic cinema events, adding yet another great community venue to the main street. Community members gather for several popular annual events, including Dogapalooza, Open Streets Carnegie, and a 5K Run/Walk in support of the Volunteer Fire & Rescue Bureau. For all these reasons, more young people are moving to this borough located five miles southwest of Downtown. Like many places in and around Pittsburgh, Carnegie is named after Andrew Carnegie. Former NFL player and coach Mike Ditka, Pittsburgh Pirates shortstop Honus Wagner and former Pennsylvania Governor and US Senator James H. Duff were all born in Carnegie. Carnegie has four borders: Rosslyn Farms to the north, Scott Township to the east, south and southwest, Collier Township to the west and Robinson Township to the northwest.